Hans Hofmann, the great abstract expressionist and teacher, was a master of tensions. He taught his students in New York and Provincetown about the “push and pull” of composition: The contrasts in color relationships, juxtapositions of forms, and the conflict between spatial illusion and flat surface. Hofmann was a great proponent of intuitive, automatic drawing,yet he would have students labor for weeks over a single still life. “Hans Hofmann Early Drawings,” now up at ACME Fine Art, demonstrates the vitality of his line. 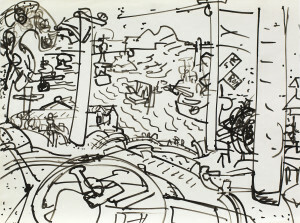 Executed with a matchstick dipped in ink, and sometimes made on the fly in his roadster, the drawings come across as breezy finger exercises. The more you look at them, though, the more you see. A voluptuous leaf takes center stage in “Untitled Sunflower.” The plant, with its sinewy stalk and lolling leaves, nearly bursts off the page, pushing into the extreme foreground, underscored by smoky shadows on either side. Yet it takes a moment to find the blossom: a spiky, awkward starburst atop a lean stem, seeming to float like a setting sun amid the far distant hills. Hofmann simplifies forms in a way that makes them, strangely, at once idiosyncratic and archetypal. He dramatically telescopes space, jamming great distances into small frames. 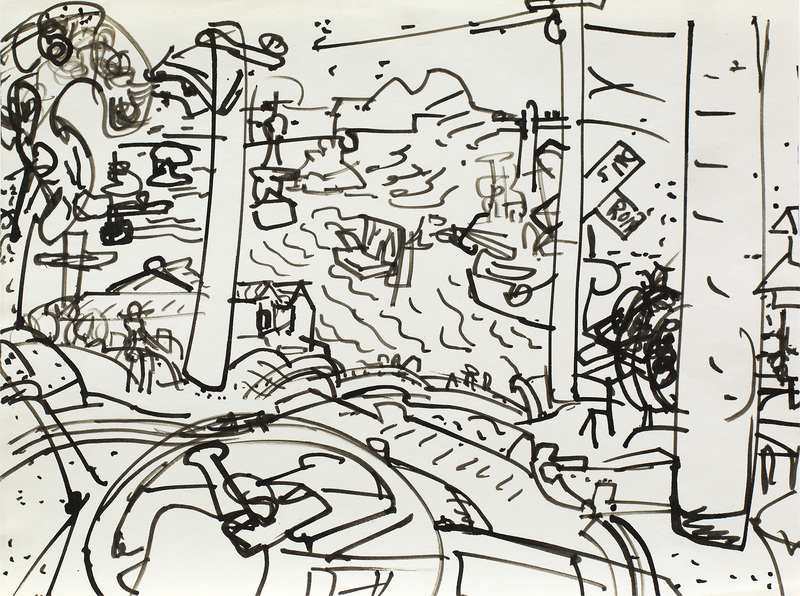 In “Untitled Landscape,” for instance, the steering wheel of his roadster sits in the foreground, and Provincetown Harbor stretches out at a steep angle in the distance. He drew the sunflower in 1943. Most of the works here were made in the 1930s, soon after Hofmann emigrated from Germany. He was in his 50s, so to call these drawings “early” seems a misnomer. But it was here that he made his name as a painter and teacher of abstract expressionism, an American wave that moved the focus of contemporary art from Paris to New York. A small pendant exhibition, “Figure by Four,” features drawings made by students in Hofmann’s classes. Lillian Orlowsky’s “Figure Drawing 01″ shows the way he taught cubist figuration, blocking the body out in angles and volumes; this one pivots around vertical and diagonal axes. The teacher has mapped out an instruction in a box on the upper left; you can see its echo in Orlowsky’s sharp angles, and in the small circle at one knee. There are a couple of black and red gouaches here, but Hofmann’s legendary strident colors are mostly missing. What we get instead, in his drawings and those of his students, is a relentless and lively investigation of structure, space, and form, pushed and pulled in ways that make them spring off the page.